Game Information: Game of Thrones is one of the most popular TV series ever created. For Microgaming to turn this remarkable series in to an online pokie makes perfect sense. Who better than the genius designers at Microgaming to do such a diverse and intricate world, the true justice that it deserves? The results? One of the most inspired and action-packed video pokie to ever grace any online casinos floors! The game features 5 reels and 15/243 paylines and is one of the most visually stunning games that Microgaming has ever produced! This title is also filled with magical bonus rounds and special features to please even the most ardent Game of Thrones fans. 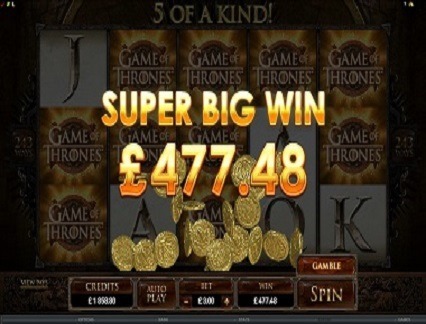 Microgaming have included their now famous 243 Ways to Win feature in Game of Thrones as well as a standard 15 payline system, the beauty of it is that players can actually choose which way they want to play the game. The idea of being able to choose whether to play the game with Microgaming’s 243 Ways to Win or a more conventional 15 payline system is brilliant. It adds much more flexibility to the gam an, along with a wide variety of coins sizes and betting options, really opens up the game to a wide range of bankroll sizes. The 5 reels contain a number of cool Game of Thrones related icons including the iconic sigils or symbols of each of the story’s main houses namely, the Starks, Lannisters, Baratheons and Targaryens. House sigils are also accompanied by standard playing card symbols to complete the population of reel symbols. Getting five of a kind of a particular house sigil will award you with a varying amount of coins, anywhere from 350 up to 600. The game also includes a few special icons which include a stacked wild, represented by the Game of Thrones logo as well as a scatter symbol, represented by the Iron Throne symbol. The stacked wild will appear in both base play and in the bonus round. 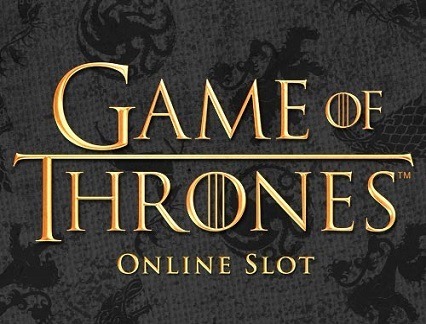 Getting three or more scatter symbols (Iron Throne) will trigger the free spins bonus round where players will then get to choose from one of the four main houses of Westeros. Depending on the house chosen, players will get a certain amount of free spins as well as certain stacked symbols and multipliers. 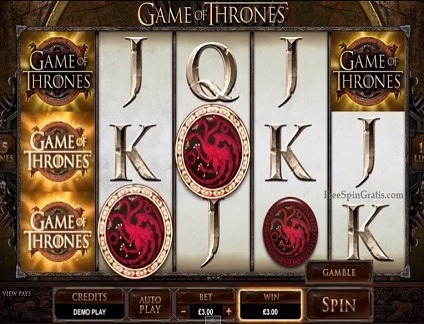 The free spins bonus round can lead to massive wins especially when one considers that getting 3 or more Iron Throne scatters during the free spins bonus round will automatically retrigger the bonus round! As one would expect from Microgaming, the graphics and sounds in this game are nothing short of superb! The high definition graphics depict many of the shows most beloved characteristics including the special colours of each house which change the reels during the bonus round, depending on which house you choose. The game also includes real clips from the show including the fire breathing dragon’s scenes and various clips of the vast and often breath-taking scenery from the show. Other special touches and details include authentic Braavosi coins and even the iconic map of Westeros, depicted as a background to the games gamble feature. The game also includes the iconic theme tune of the show. While Game of Thrones is not a progressive jackpot game like Microgaming’s other titles such as Mega Moolah or Major Millions, the game is still capable of producing respectable paydays, depending on whether the 15 payline or 243 Ways to Win modes are chosen. Choosing the more conventional 15 payline option will produce a highest payday potential of 1500 coins while choosing to play in 243 Ways to Win mode can produce a maximum payday potential of 605000 coins, significantly more. One of the best special features found in Game of Thrones is the famous dragon’s egg and getting two or more Iron Throne scatters will hasten the appearance of the famous and iconic egg, which will reveal a special prize to the player. The game also features a cool gamble feature where players get to flip a Braavosi coin. A correct guess will see them go head to head with an array of characters from the series in various challenges.